The General Data Protection Regulation is here at last, and continues to evoke both anxiety and confusion given its undoubted impact on many aspects of what we do, not least direct marketing. If you read no further just take with you the fact that if you need a good business list which is legally safe to use speak to us at Corpdata. We have thought long and hard about GDPR's impact and we discovered a route through the choppy waters that it brings. That's why Corpdata completely re-engineered the way we telephone research UK business information. Our revised tele-verification process ensures that you still benefit from accurate and up to date business information but with the additional benefit that your due diligence is covered. It's not only what we supply, it's also how we supply our business lists that keep our clients the right side of the law. That's why we introduced our ‘rolling license' so you comply with the principle of ‘storage limitation'. We provide twice monthly updates so you comply with the ‘accuracy' principle. This also means you continue to satisfy the ‘balancing test' requirements for the data usage to be ‘lawful', by ensuring you respect the wishes of the data subjects you have targeted as potential new customers..
Business is largely about risks, and rewards. As the smoke begins to clear you can more clearly understand GDPR, its impact on your new business acquisition and the risks you face if you don't understand and act on the basics. But like most risks, it comes with opportunity. When thinking about new business generation, those organisations that take the lead in respecting data subjects and learn their lessons first, may very well steal a march on their competitors. GDPR isn't intended to prevent business thriving, or even to make businesses struggle. It has the simple objective of ensuring personal data is used in such a way as to protect us from risk and exploitation. The price to be paid is that everyone processing personal data will need to do it responsibly, putting the rights of individuals at the centre of how personal information is used. If something does goes wrong you will no longer be able to pass off the responsibility and point the finger of blame at others quite as easily as you could yesterday. GDPR explicitly makes you responsible for infringements unless you can prove you are not. You now need to be able to demonstrate you have done your due diligence on whoever supplies you with marketing lists; how they collect their names and details, and during this process what they have told the data subjects. You need to be sure about how your list supplier will keep their lists accurate and so forth. Only then do you have the proof you need. Increasingly we hear of clients who are told by other list suppliers that their marketing lists are GDPR compliant BUT when these suppliers are asked how, it goes quiet, no answer at all. In addition to your due diligence we can also help you satisfy your requirements, such as 'Balancing' or 'Necessity' tests. Ask yourself what help you'll get from your list supplier if someone complains about your direct marketing. If you do your due diligence properly you'll realise that Corpdata have what it needs to show we have both been thorough and done things properly. If your data supplier isn't willing to give you a sensible outline of what steps they have taken you should be suspicious. Worse still if you ask and they won't return your call. You'll really be on your own. GDPR contains specific provision for direct marketing, so your list acquisition and subsequent use really does need to be done correctly. That's why we've been working so hard to ensure you can continue to win new business in a GDPR age. When people on your Corpdata mailing list change what they want we'll let you know – keeping YOU safe. We know how to do things properly so it was obvious that GDPR would have a significant impact on every aspect of our operation, and also our clients. We thought about the impact from many angles and so over two years ago we changed how we tele-verify our business contacts and the processes that we will use to ensure our clients remain compliant after May 25th. Our research team are highly skilled, most having been at Corpdata for years and they soon adapted to this very different way of validating not only the usual company and decision maker details but also the individual marketing preferences of those we hold within our database of UK business contacts. So we not only record the preferences toward marketing from third parties who use post, phone and email but the Corpdata Rolling License provides twice monthly updates, allowing you to show that your direct marketing respects your prospects, and any change in their preferences. 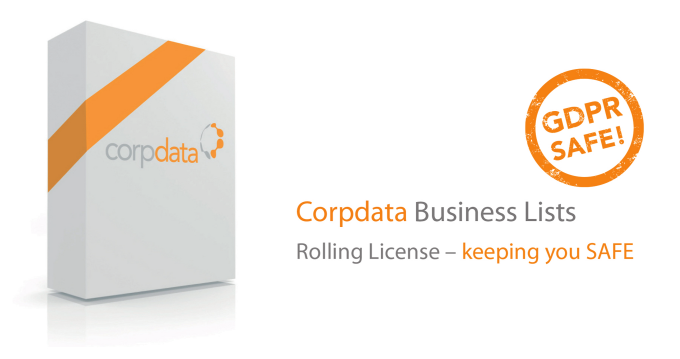 Corpdata's Rolling License is the only third party offering currently available that ensures you do this and because of our emphasis on doing things right, you can demonstrate that your due diligence in selecting your business list was done properly and that your use of the information within your list is respectful to those you contact and so LEGAL. We think that this is the key to potentially even greater success. If you do things right you'll not only be able to generate the new business you need but those that don't will find themselves really stuck, which will expand your opportunity. Our reputation has been grown over the years on the basis that the more accurate the list you use the better your results; not only will your Corpdata Premium on our Rolling License be accurate and up to date but because its built around the preferences of those we speak to you can contact them in the way they prefer. There is also the added bonus that each twice monthly update is telephone preference screened to, added little aspect you no longer need to worry about. Corpdata contacts can still be supplied on a single use basis, but most clients want to nurture contacts on an ongoing basis so choose our rolling license. Business premium Rolling license costs £150 per 000 and thereafter £35 per 000 per month or £450 per 000 for the following twelve months. And by that we mean that our telephone research process is very different, but the outcome is still the same – accurate up to date business contacts and with the detail to allow accurate targeting of direct marketing. You have hopefully read about how we telephone research our business lists. SORRY if we go on about it too much but we are very proud of what we do. Our business lists have always generated a very positive impression from most people who use them. This with little doubt is because we have a great team of people who from nine in the morning to five in the afternoon telephone and ask what needs to be known. Matt How has been managing our telephone research for over twenty years and over that time the fundamentals have not really changed much, until now. "It's still about training, encouraging and making sure people get things right. Whilst this is simple to say it's sometimes a challenge to do." "GDPR has changed what we now need to ask and record, for instance it took a good few months for some in my team to understand the difference between ‘legitimate interest' and ‘consent'. Most understood straight away but a few of my team took a while to really distinguish the difference." This is just one example of how GDPR impacts on what we and our clients do; we now know that you have to decide on what basis you hold information that identifies a person so if as we do we hold personal information on the basis of legitimate interest you can't then ask a person for their consent it doesn't work that way. Your direct marketing isn’t the only business activity impacted when GDPR arrives. Most people now realise that using ANY personal information requires a significant amount of thought and some carefully planned action. The ICO recently informed us that GDPR’s arrival on May 25th is not the deadline, but the start of the journey. As the old Chinese saying goes every journey starts with a single step. We at Corpdata started our journey well over two years ago because collating and supplying business lists was going to fundamentally change. The steps we took included re-engineering our entire telephone research processes. This now enables us to supply you with our highly productive business lists, which remain accurate and up to date, but also guarantee the contact names are safe to use under the GDPR regime. So, you’ll get the return you expect while ensuring you have covered your due diligence requirements. Contact us to fully understand how our business lists help you on your journey, and how we ensure our data won't get you into trouble with GDPR. If you are feeling worried about how you can become compliant with GDPR across your whole organisation, our compliance division, Dept679, can help to become GDPR compliant and keep you that way.